n past issues of Retrievers ONLINE, I have reviewed three of Bill Hillmann’s DVDs including Training a Retriever Pup, Training any Breed of Dog with the Soft Collar and The Fetch Command. In those reviews, I gave some details on Bill’s approach to training and his techniques, especially when they differed from conventional. I have become a solid advocate of his puppy training emphasis on balance between fun/excitement and control, notably with sit and patience. I have only put two pups through a similar program but my experience with many other pups has allowed me to say how much I think it will work with most dogs. I have heard a few people that train gun dogs say that they think it requires a real high desire dog or is only necessary with such. While I do tend to end up with such high desire dogs, I also think that, if anything, Hillmann’s program is MORE suited for lower desire dogs than the higher ones. Of course, it can be a godsend for the high desire dogs because it doesn’t allow them to act like wild hooligans for a year. That invariably results in a lot of abuse. In the good ole days it would be BSE – Boot, Shoot and Electrocute. We hope those days are gone but I fear not. When I heard about Bill’s latest DVD called Traffic Cop, I wondered how he could do a whole DVD on that subject. As many of you may know by now, Bill refers to the procedure of standing between the bumper/bird and the dog with an outstretched hand as Traffic Cop. Even when you just put yourself out in the field, throw a bumper, and have the puppy sit and wait to be sent, it is a form of Traffic Cop. Long time subscribers to ONLINE will know that I have been doing this for many years when Training Retrievers Alone. My DVD illustrates that procedure for marks which I have called Stand Alones. I think my section on how to teach it was about 2 minutes long. That’s because, originally, I only did it with older dogs that had already been steadied by conventional methods. It makes so much sense with young puppies if you balance it with fun, exciting retrieves. The Traffic Cop DVD has three Chapters which are: Training Level before you start Traffic Cop, Learning Traffic Cop as a Puppy and The Three Levels of Traffic Cop. 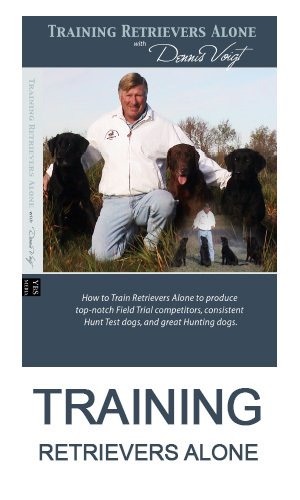 Chapter one is the most basic and reviews the parts of the Training a Retriever Puppy DVD on things you want to do before starting. They are: chase something to get your dog excited, walk on a lead and sit (sit means sit!). The most significant thing you will learn in this section is the amount of reinforcing that is required using this method. It is done with far less pressure than conventional and is done over a longer period of time. Because of the dog’s age, this is inconsequential in the long run. Chapter 3 – The three levels. This is the longest section and the one I personally found the most interesting. Here Bill explains that Traffic Cop is NOT steadying. This may come as a surprise to many of you! Rather, Traffic Cop is reinforcing the ‘sit’ command. Later, Bill will work on steadying. Now he works on reinforcing sit. This isn’t just semantics; it is a clear distinction. Level 1 is illustrated with a 2-year-old dog. Perhaps, unfortunately, it is the same but older dog as seen in Chapter One at 5 months. Nonetheless, a big lesson is distinguishing between correcting when the dog moves and reinforcing when the dog sits. For those of you that have read my earlier learning theory articles or know about operant conditioning, this is an example of punishment versus reinforcement. Punishment is used to stop a behaviour, reinforcement is used to increase a behaviour. I find it fascinating that many top trainers have learned this distinction even though they don’t use these terms and, in some cases, have not even studied classical learning theory. Bill goes onto illustrate the proper use of Traffic Cop with another dog, a Golden. Level 3 focuses on the introduction of a thrower. This is done when you can do a Stand Alone at 80-100 yards with NO Motion by the dog. Bill illustrates the step-by-step sequence of gradually increasing distraction and excitement. I am quite convinced that most people have previously shortened what Bill recommends as a multi-week process into a 1-2 day process. Thus, this emphasis on building was also a revelation. Well, I’ve given you the secret, but frankly, most everybody should watch this DVD over and over to have it really sink in. 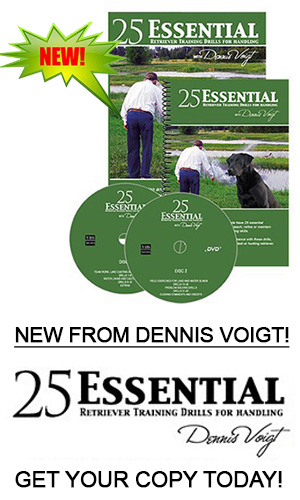 One never gets all the benefits from a training DVD by watching it only one! As described in my last review, the Hawkeye DVDs get better and better from a production standpoint. This is largely the result of Mary Hillmann, who does the entire behind the scenes work and continues to improve in her videography and post-production effects. The Traffic Cop DVD is available from www.hawkeyemedia.net for $79.